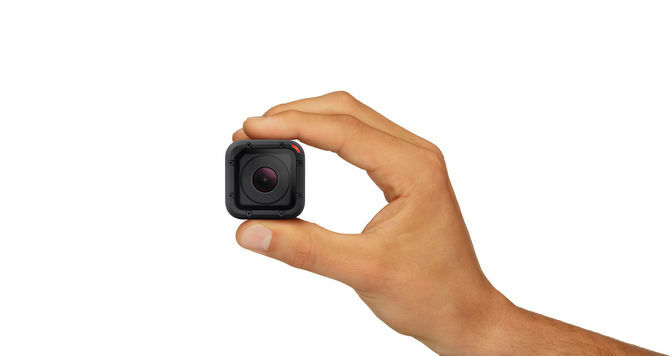 So you think that the GoPro Hero 4 is small do you? Well, GoPro just shrunk it down again, by 50%! 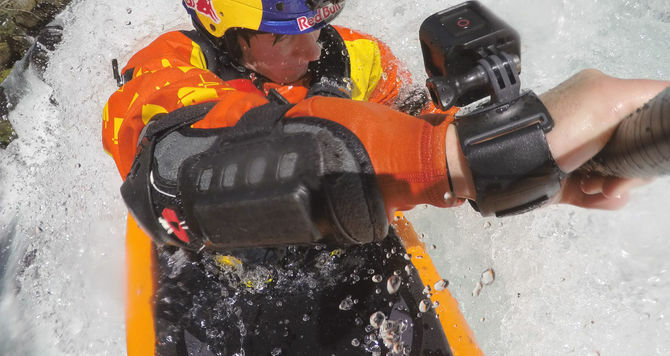 Say hello to the GoPro HERO4 Session, the smallest GoPro ever made. Is this a dramatic shift in HERO design, or a new model for more custom applications like Virtual Reality and drone applications? At only 1 1/2-inches square, half the size of the original GoPro HERO4 Black Edition, and weighing in at 40% lighter (we’re talking 2.4 oz), the GoPro Hero 4 Session’s cubed ultra compact design means you can literally put this bad boy anywhere. The HERO4 Session allows you to shoot 1440p video at 30 fps, 1080p at up to 60 fps, and 720p for slow motion 100 fps. The HERO4 Session also takes 8 megapixel still shots. 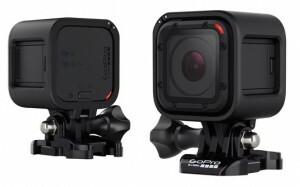 Like all GoPro cameras, this one is waterproof up to about 32 feet, and needs no additional waterproof housing. This looks to be where GoPro is going, with an all-in-one design that omits any need for an additional removable housing. The downside of this, however, is that you can’t remove the battery. But this thing is so small, I’m not sure you’d want to do that. The HERO4 Session has two buttons that do it all… A power/record button, and a WiFi button that does a few additional things. To record, simply press the power button and the Session turns on and begins recording automatically. When you’re done with the shot, you simply hit the button again and it stops recording and turns off. This all in one recording design saves can extend your battery life immensely (which is rated around 2 hours of non stop recording before needing a recharge). You do have to time your shots, however, as it takes about a second and a half for the HERO4 Session to turn on and begin recording, and again to turn off. Still, that two hour battery rating gets extended exponentially when you’re shooting brief shots and turning it off. Hold down the button for about 5 seconds and the HERO4 Session will go into timelapse mode and shoot 8MP stills every half second. The second button in the back activates WiFi, displays selected video mode, and adds a tag while you’re recording. Is that all the HERO4 Session does? No. It can do a lot more, but those additional features must be activated by the GoPro Smartphone app, but I’m also betting that Removu R1 LCD Remote will also work (maybe with a firmware update). In fact, the HERO4 Session would make a perfect pairing for the Removu R1. You’d have the Session on one wrist, and the LCD on the other. GoPro also took some time and redesigned the microphone, and the HERO4 Session has two of them, one in the front and one in the back, and the Session switches between the two automatically to get the best possible sound. This was created to address the annoying plopping sound that a HERO makes when it comes out of the water and it’s a marked improvement. That also means that the Session will be able to pick up the users’ voice better by switching to it. Another cool feature is that the GoPro HERO4 Session has a cubed style frame, which the Session can mount in any configuration, thanks to it’s perfectly square design, which has button access on all four walls. So you can put the camera in the Frame in any position to mount it. That’s cool. So why did GoPro make this camera? Well, I’m betting it’s main function is for virtual reality. You can conceivably pack twice as many Sessions into a 360° housing as you can standard HERO cameras, and that means far more coverage. It’s also a heck of a lot smaller for drone use. 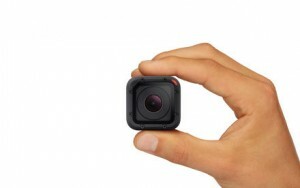 So if GoPro is looking to get into the drone market, as Nick Woodman hinted at earlier this year, this smaller HERO4 Session would be a cool addition that can put it anywhere. But all this compact design comes at a price. A serious price. $399. That’s the same price as the standard HERO4 Silver edition which brings with it an LCD Touch screen. The same price and you get less options? Hmmmm. I’ve also heard that the sensor that GoPro put in the HERO4 Session offers limited dynamic range and less detail, so users may find their shots a bit lacking compared to what they can get with their standard Hero 4 or even 3+. But what you’re paying for here, really, is the form factor. And I’m not convinced yet that is a good enough feature for the price. New mounts also announced include a spring clamp mount for musicians called the GoPro Music Jam, which comes with a magic arm extension, and a friction screw that keeps the clamp tightened no matter how much you move it around. It’s a nice design. There’s also the GoPro Strap, which allows you to mount your GoPro HERO to the back of your hand, on your wrist or even leg. Just about anywhere else on your body to lock it down. This allows for hands free shooting. The Strap also comes with a wrist strap and a longer arm and leg strap. The GoPro mount that comes onto it, has a 360° swivel design, as well as an adjustable angle mount to get your camera just where you want it and not have the Strap mount in the shot. 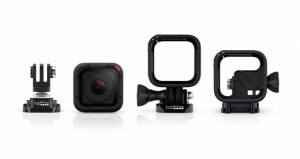 It’s a pretty slick design and could be the best GoPro mount yet. Both mounts are $69.99 and $59.99 respectively. The HERO4 Session is available for Pre-order right now, and will ship July 12. The mounts are available now. For more information, visit GoPro.com. Get Geeked: Studios Planning At Least 142 Sequels, So How Many Are Too Many? Are Marvel & Fox Bringing X-Men, Fantastic Four Into The Marvel Cinematic Universe; Is Bryan Singer Directing FF 2?